We were looking to make something light, fast and easy last night. This salad was perfect. We tried out a new salmon spice and because we are not really fans of arugula and we had butter lettuce on hand, we used that instead. It turned out great for the hot summer evening to eat on the patio! 2. Whisk together capers, rind, juice, oil, 1/2 teaspoon salt, and garlic in a bowl. 3. Place beans in a bowl; drizzle with 2 tablespoons caper mixture. 4. Place salmon on a foil, cover with melted butter and sprinkle with magic salmon seasoning. Cook on the grill until desired done-ness. 5. Add salad and onion to bowl with beans. Drizzle with remaining caper mixture; toss. 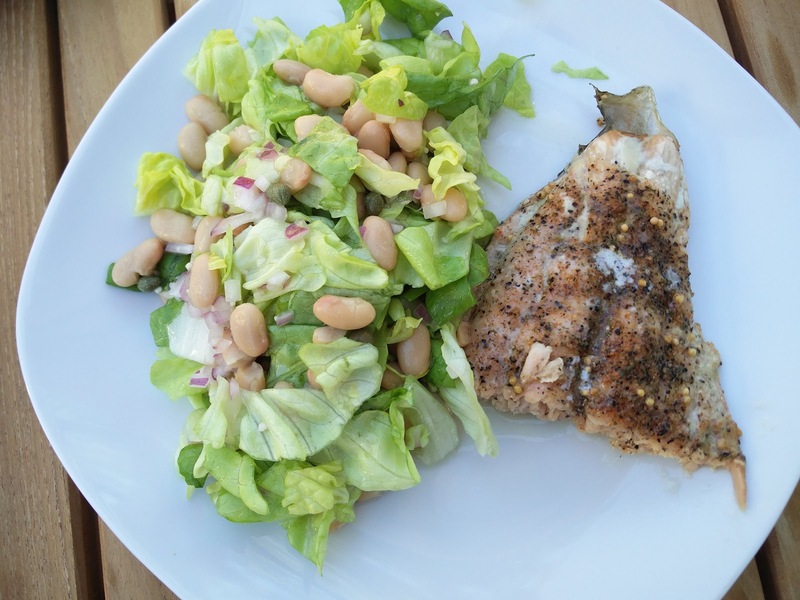 6 Divide salad among plates; top each serving with 1 fillet. Serve immediately. He enjoyed his pepperoni cheese sandwich more.